Mark Rylance Goes Fishing But What's The Catch? 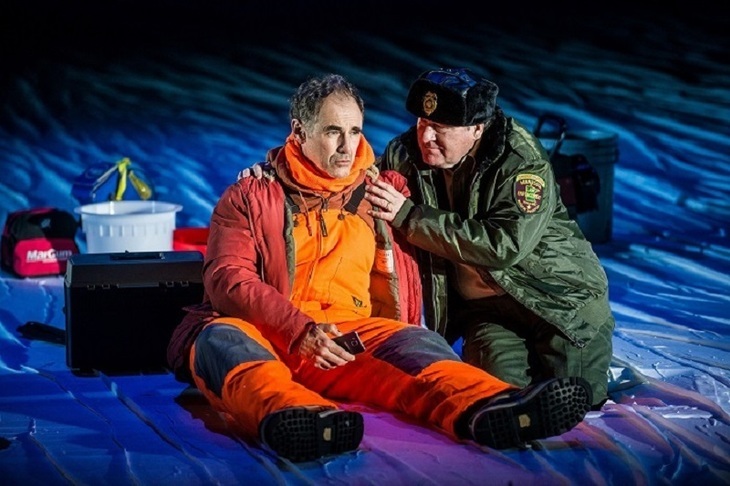 Nice Fish starring Mark Rylance continues at Harold Pinter Theatre until 11 February. Mark Rylance's latest outing is something of a passion play, not to mention a personal one. Rylance is Nice Fish's star turn and, with Louis Jenkins, its co-writer. The Bridge of Spies actor is a big fan of the American: not only did he use the prose poet's works twice in lieu of an awards acceptance speech but this play is something of a mosaic of Jenkins's back catalogue. As well as the artistic bromance with Jenkins, Rylance's wife Claire Van Kampen is on board as director and the production is dedicated to her late daughter Nataasha as well as two of Rylance's deceased friends. With so much love and emotion in the air, it is strange that so much of Nice Fish is distinctly dull. Rylance is excellent as the sweetly innocent fisherman Ron who has come along with the more experienced, and decidedly more intense, Erik for a spot of ice fishing. They are soon joined by two men — the doggedly bureaucratic DNR man played by Bob Davis and grizzled angler Wayne (Raye Birk) as well as Wayne's granddaughter Flo (a very sparky Kayli Carter). There's some joyful use of clowning and puppetry to help enliven the wordiness of it all albeit not enough to prevent ennui creeping in around the halfway mark. Coming across as some kind of frozen Waiting for Godot, there's little in the way of action, the characters are rain puddle-deep and there are only so many mini-monologues one can take. After setting up the premise of the odd couple fishermen, the pace seems to lag and any scene bereft of Rylance is left with only Jenkins's words to carry the dramatic weight. And, while there is many a bon mot, the constant stream of the poet's work kills the impact of his quirky observations and wonderful insights. This play doesn't quite cross the line into the shamelessly indulgent but that line is certainly visible. Like a fisherman who waits all day for a sniff of excitement before reeling in a whopper, Nice Fish takes most of its 90 minutes running time before coming good. What would on any other night be judged as a solid two-star outing is redeemed when a four-star finale hoves into view casting a comedic eye over what has gone before. Purgatory becomes heaven and no-one goes home empty-handed but the last-minute touch of genius is not enough to salvage what has gone before. Nice Fish continues until 11 February at Harold Pinter Theatre. More information can be found on the official website. Want to see Nice Fish from a VIP box for free? Here's how. Londonist attended on a complimentary press ticket.